When it comes to Norwegian acts making the UK chart you can count them on one hand. It’s likely A-Ha will spring to mind first and then, obviously, there is one quarter of Abba and they are the only two acts to have UK hits running into double figures. Actually there are a couple of new acts around at the moment namely Kygo and Alan Walker so let’s see if they can maintain a lengthy career. This week it’s a one hit wonder from 1988 which only reached the dizzy heights of number 43 but maintained a healthy 11 weeks on the chart. 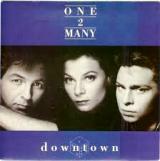 Who remembers One 2 Many? No? Ok read on. The original lead singer left and they wanted a female to replacement. A friend of Kolsrud, an entrepreneur called Ola Mæle rang to say he had found the lady he’d been looking for. The lady was Camilla Griehsel which he had charmed in a clothes shop in Verbier, Switzerland, in January 1988. Ola: “I would buy a shirt. But the saleswoman was exceptionally nice, and I came out with two shirts under my arm. Later in the evening I met her at a bar, and we continued the talk and she agreed to join the band. With Camilla in place Dag and producer John Hudson added the missing vocal tracks on the backing that was already recorded in Mayfair Studios in London. In the studio next door, The Bee Gees were recording tracks for their E.S.P. album and the piano player, Peter-John Vettese, came in. They got talking and Kolsrud asked Peter-John if he could play a piano solo on Downtown reminiscent of Bruce Hornsby and the Range’s The Way It Is, he duly obliged and it was added to the mix. They only released one album which was 1988’s Mirror which featured a choir of which one member was Sheryl Crow who had been on Michael Jackson’s Bad Tour as a backup singer. The saxophonist was Kim Wilde’s boyfriend at the time, Gary Barnacle who had played with Big Fun and was the guest blower on the single version of T’Pau’s 1987 chart-topper China in Your Hand. The song initially charted in mid-November 1988 spending four weeks on the listing and they began to receive a lot of music press publicity and it was Boy George’s brother who would take press photos of them. The press was a little delayed but following its appearance on the Billboard chart, the track was re-issued in the UK in June of 1989 and received more airplay and climbed to number 43 adding a further seven weeks to their chart tally. They released three further singles in 1989, Another Man, Writing on the Wall and Nearly There which all went unnoticed across Europe and so the band called it a day. Kolsrud went on to join a band called Guys in Disguise and then pursued a solo career as well as returning with A-ha as their world tour musical director. Camilla Griehsel met and married Black singer Colin Vearncombe in 1990. She turned her hand to opera and released the album, Rum and Chocolate in 2008. Vearncombe died in a tragic car accident in January this year. Jan contacted me in October 2016 to let me know his situation, he said, “Despite contracting MS I’m still writing songs with my band The Commodities. I have this somewhat successful song on YouTube Yellow Car.” It can be viewed her by clicking here.